Whew, yesterday was pretty warm. 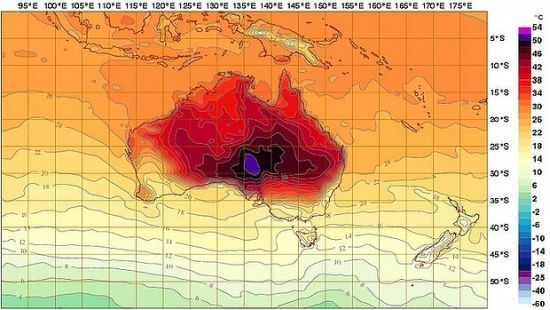 In fact, it was so hot across Australia that our Bureau of Meteorology had to add new colours to their standard temperature map! The scale previously only went up to 50º C (122º F). On Monday, the highest average national temperature ever recorded was exceeded – the record now stands at 40.3º C (104.5º F). That’s the average temperature across an area the size of mainland USA! It may well have been broken again yesterday, but the BOM haven’t released the figures yet. This is the first incidence since records began of five consecutive days above 39º C (102º F), and the heatwave isn’t over yet. 2013 is already the year with the most daily temperature records broken (6) since records began 112 years ago, and we’re only 8 days in! As always, with the high temperature comes very high fire risk. We’ve had a really good couple of years as far as rain goes, so there has been a lot of vegetation buildup. A week of scorching heat has dried it out like kindling, so any fire that starts quickly gets out of control. Major fires all over the place. Thankfully there are none close to us – a combination of good management by the authorities and very good luck. There is a fire down south near Sussex Inlet, though, that is out of control and is burning north towards Huskisson where my parents live. Hopefully that will be brought under control today. To all the firies and others out there fighting all those fires – we’re thinking of you, and wishing you well. We’re also thinking of the people in evacuation centres, and hoping you can return home safely soon. Closer to home, Megan had a busy afternoon trying to keep the animals cool (I’m back at work). She draped wet towels over the rabbit pens, and kept cool water up to everyone. The nearest weather station to us (Albion Park), recorded a high of 43.1º C (110º F) yesterday. Kiama, being on the coast, recorded slightly lower at 42º C (107º F). Despite Megan’s best efforts, we lost one of our breeding does who had just delivered a litter of 8 kits. We think she was run down from the birth and producing milk for her babies, and just couldn’t cope with the heat stress. The babies all died as well. Very sad. We won’t be breeding any does in December or January from now on, to minimise the risk of this happening again. The dog, chickens and ducks all fared well. We’re pet-sitting some budgies for friends who are away, and thankfully they’re fine as well. I had been clearing our roadside verge last week using my new scythe (more info to come! ), and I need to finish that off ASAP. There was about 3-4 years of grass growth, with lots of dry grass underneath. If some idiot flicks a cigarette out as they drive past, it’ll quickly catch and burn up the embankment. Thankfully it’s a lot cooler today, but temperatures will climb back to similar levels this weekend. If you’re in Australia, how did you fare in the heat? The Great Chest Fridge Conversion Project Begins! Its been hot here in QLD, but not that hot, yet, I think our turn is coming in the next few days. Not looking forward to it. My strategy with the animals is to just let all the chickens free-range and they can find themselves a shady spot, I don’t mind missing out on eggs for a few days just to know that they are comfortable. We have baby chicks at the moment and only have the 25 W heat lamp for them overnight, as the day time temps are hot enough without any extra from the lamp! Sorry to hear about your rabbit and kits, that must have been very sad. A few hot days ranging from 37-41c here in Melton. 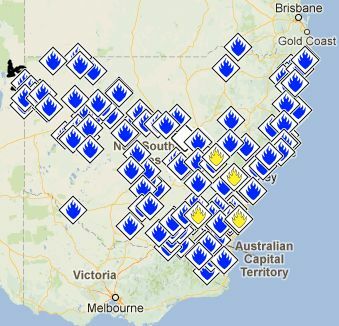 No major bushfires in our area (yet), but there is so much potential fuel just waiting for that tiny spark to set it off. Our chooks have survived so far, changing the water often and letting them free range around the yard. Sorry to hear about the bunnies.